Moreover, not all contaminants immediately sink and bind to or get encapsulated by sediments. Some materials can be transported by ocean currents. Because the Navy's EIS uses ocean dispersal and chemical degradation as its rationale for claiming no adverse impacts on species or habitats -- anywhere, ever -- it should be noted that the expended material from local warfare exercises may not tell the whole story. In other words, perhaps all of the contaminants in question should be added together to get an idea of the full impact. Truthout recently reported that the Navy has admitted to releasing chemicals into the oceans that are known to injure infants' brains, as well as having left large amounts of depleted uranium in US coastal waters. 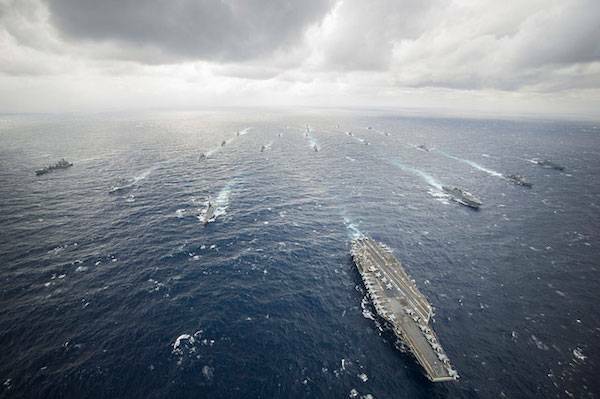 Now, the Navy's own documents reveal that it also plans to use 20,000 tons of heavy metals, plastics and other highly toxic compounds over the next two decades in the oceans where it conducts its war games. According to the Navy's 2015 Northwest Training and Testing environmental impact statement (EIS), in the thousands of warfare "testing and training events" it conducts each year, 200,000 "stressors" from the use of missiles, torpedoes, guns and other explosive firings in US waters happen biennially. These "stressors," along with drones, vessels, aircraft, shells, batteries, electronic components and anti-corrosion compounds that coat external metal surfaces are the vehicles by which the Navy will be introducing heavy metals and highly toxic compounds into the environment. "None of these belong in the ocean's food web, upon which we all depend," Karen Sullivan, a retired endangered species biologist who cofounded West Coast Action Alliance, which acts as a watchdog of Naval activities in the Pacific Northwest, told Truthout. "Nor will the Navy be willing to clean it up, or even contribute to medical tests for people whose health may suffer." The Navy is, like all the other branches of the US military, ridiculously well-funded. Recent history shows that US military spending dwarfs the rest of the planet's military spending. "For the last half-century, US military spending has purchased the annihilation of millions throughout Southeast Asia, the Arab world, and Central Asia," Mozhgan Savabieasfahani, an environmental toxicologist and winner of the 2015 Rachel Carson prize for her work on depleted uranium (DU) and heavy metal contamination, told Truthout. "Accompanying that human annihilation has been environmental devastation and birth defects, from Vietnam to Iraq." The US Department of Defence [sic] is one of the world's worst polluters. Its footprint dwarfs that of any corporation: 4,127 installations spread across 19 million acres of American soil. Maureen Sullivan, who heads the Pentagon's environmental programs, says her office contends with 39,000 contaminated sites. The US Safe Drinking Water Act defines "contaminant" as: " ... any physical, chemical, biological or radiological substance or matter in water. Drinking water may reasonably be expected to contain at least small amounts of some contaminants. Some contaminants may be harmful if consumed at certain levels in drinking water. The presence of contaminants does not necessarily indicate that the water poses a health risk." Thus, contamination being a matter of scale, the government creates a "not-to-exceed" level based on what it knows about each contaminant, in order to minimize human exposure to each item on its massive list of contaminants. However, the contamination guidelines don't account for the kind of pollution perpetrated by the US Navy. "What do you do when it's massive quantities of contaminants in the ocean, and not your drinking water?" asked Sullivan, who worked at the US Fish and Wildlife Service for more than 15 years and is an expert in the bureaucratic procedures the Navy is supposed to be following. She pointed out how "contamination," or water pollution, is defined as "environmental degradation that occurs when pollutants are directly or indirectly discharged into water bodies without adequate treatment to remove harmful compounds." On that point she said, "None of the dangerous compounds being dumped into our waters by the Navy have ever been treated or removed, which leads to hearing this false choice: The cost of cleanup or removal would be exorbitant. Therefore, we should continue dumping as always, in perpetuity." Navy spokesperson Sheila Murray told Truthout that depleted uranium on the seafloor was no more harmful than any other metal, a statement that flies in the face of numerous scientific studies that have proven otherwise. Sullivan believes that, by making that statement, the Navy "has disavowed responsibility for all of this toxic ocean pollution." "A cluster of worsening environmental phenomena go hand-in-hand with that accumulation of pollutants," she told Truthout. "Global warming, mass extinctions, ecosystem collapse, food-web modification, physical and biological changes in organisms, endocrine disruption, and a pandemic of neurodevelopmental disorders in children accompany those rising background pollution levels. Peer-reviewed research is already showing steep declines in the biodiversity of ecosystems." For example, perchlorates are highly soluble in water and according to the EPA, "generally have high mobility in soils." They have been found in breast milk, target the thyroid gland and affect children and fetuses more than they affect adults. Sullivan says all of this raises questions about why there are no regulations preventing the creation of Superfund sites (polluted locations that require intensive clean-up) in the ocean. "We depend on salmon, yet the Navy is creating massive ecosystem-wide pollution right under our noses," Sullivan said. "How can they not see that it will be generations from now who reap the bitter harvest?" "Toxic metals, such as lead and uranium, are biomagnified," she explained. "'Biomagnification' means that toxins get more concentrated in an organism which ingests plants or animals containing that toxin. For example, contaminated fish can pass on large doses of toxin to their human consumers." The 20,000 tons of contaminants the Navy plans to release into the ocean in the coming years do not include the additional 4.7 to 14 tons of "metals with potential toxicity" that will be "released" annually in the inland waters of both Puget Sound and Hood Canal, according to Naval documents. Given that those numbers are for one year only, in 20 years, between 94 and 280 tons of heavy metals will be released inland (in addition to what will be released in the open ocean). It is also worth noting that two actual Superfund sites along Washington's inland shorelines are both on Naval property. "In addition to the toxic contaminants deliberately dumped, what happens to their land-based toxic brews when torrential rains like we had in October overwhelm storm water runoff systems?" Sullivan asked, then provided the answer. "They end up in Puget Sound and Hood Canal." Naval documentation also reveals that over the next 20 years, the weights of the various contaminants include 6,739 tons of unrecoverable sonobuoys (including their animal-entangling parachutes and batteries which leach lithium for 55 years), and 396 tons of small-caliber rounds, the latter comprising only 2 percent of the total weight of "expended materials." The Navy's flares, which weigh between 12 and 30 pounds apiece, are used 824 times annually, adding up to 16,480 flares weighing between 200,000 and 500,000 pounds over 20 years. The Navy admits that the flares leave toxic residues whenever they are used, saying, "Solid flare and pyrotechnic residues may contain, depending on their purpose and color, an average weight of up to 0.85 pounds of aluminum, magnesium, zinc, strontium, barium, cadmium, nickel, and perchlorates." Another issue is unexploded ordnance, or, as it's commonly known, "duds." In the Navy's 2015 Northwest Training and Testing EIS, it quotes several studies, saying, "contamination of the marine environment by munitions constituents is not well documented." This is often the Navy's claim, used to show its actions are not deleterious to the environment, when "not well documented" actually means that it has not looked for or measured its impacts on the environment. Regardless, the need for more data does not mean it is scientifically sound to assume there has been no damage. In the section of the 2015 EIS on Cumulative Impacts, the Navy says, "Long-term exposure to pollutants poses potential risks to the health of marine mammals, although for the most part, the impacts are just starting to be understood." The impacts include " ... organ anomalies and impaired reproduction and immune function." There are multiple other examples of such doublespeak within the Navy's own documents. Another example is in the EIS section on Sediments and Water Quality, where the Navy claims that "slow but significant removal" of two types of explosive material (RDX and HMX) happens through a chemical reaction whose speed is dictated by the pH [acidity] of seawater. Adequate proof is not provided by the Navy, yet risks to human health from these toxins has been extremely well documented. It could be argued that the Navy's gross negligence of its environmental impacts amounts to a federal agency passing off wishful thinking as science. The toxic legacy of this negligence will be passed down to generations far beyond our own.